Fashioned from blown glass at the Cristalleries Royales de Champagne, the magnificent decanter of 1888 has a 24 carat fine gold thread made by Les Etains d'Anjou. The elaborate wooden gift box that houses Cuvée 1888 is the epitome of refinement, it is also a highly decorative object. The elegant hues of the wood are reminiscent of the warm tones of the world of cognac and Havana cigars. The small drawer nestling in the base holds a beautiful fob watch with a flick mechanism, a reproduction of a model designed in 1880, gilded with fine gold. When the lid is opened, the watch reveals a solid perfume that will create the ideal scent environment in which to savour this unique cognac: 1888. A limited edition of only 1,888 of these 700 ml decanters in wooden gift boxes has been produced. 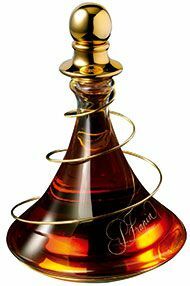 Cognac Frapin Cuvée 1888 is one of the rarest blends of cognac created in the recent years. It is selected from the most precious vines, some of which even predate 1888, passed down through the generations and a tribute to the extraordinary achievements of the company's eponymous founder Pierre Frapin. In 1888 he replanted the vineyard, previously decimated by phylloxera, with American rootstock from Denison Texas. That same year, he was preparing to participate in the World Fair of 1889 in Paris. As Gustave Eiffel was entering the final stages of construction of his famous tower, Pierre Frapin was busy selecting the cuvee that would be awarded a gold medal. This Gold Medal is still kept in the "Eiffel Cellar" at the Frapin estate in Segonzac, where Eiffel was subsequently commissioned to design a commemorative “chai” which today remains a local landmark. This is a blend created by cellar master Olivier Paultes, consisting of very old Grande Champagne cognacs that are distilled on their lees and matured in the cellars of the Château de Fontpinot. 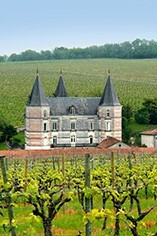 Cuvée 1888 demonstrates the alluring floral notes of the Folle Blanche grape, which is no longer used for making cognac. The aromas reveal notes of dried fruit, walnuts and hazelnuts, raisins and prune with candied orange and enchanting balsamic, roasted, toasty notes of cocoa and coffee beans. The palate is a showcase of sublime harmony, floral notes mingling with the sweetness of linden and peppery overtones, sweet spices, summer flower honey and vanilla, leather and aromatic woods. Powerful yet subtle, it combines history with blending expertise resulting in a tribute to Cognac’s Grande Champagne Premier Grand Cru vineyards.